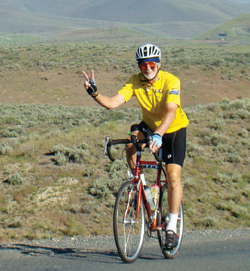 Why would a seventy-three-year-old retired Episcopal priest choose to ride a bike from Oregon to New Hampshire in the heat of summer? "It was the challenge," explains Al Halverstadt '57, "I wanted to see if I could do it." Al easily convinced Rick Garbe, his sixty-five-year-old biking friend and fellow Denver resident, to join him. For added motivation, the duo decided to raise funds for the Cancer Research Center at the University of Colorado, setting $100,000 as the goal. Halverstadt and Garbe joined a tour led by America By Bicycle along with forty-two other riders, seven staff people, and three support vans. The youngest rider was twenty-two; most were in their fifties and sixties; and Halverstadt, at seventy-three, was the oldest. The trip took fifty days, which included five rest days. Most riding days began early at 6:00 or 7:00 and ended in the early afternoon. The riders averaged over eighty miles a day, propelled by five one-hundred-mile-plus days. "We would usually ride in 'pace lines,' of six or seven people," says Halverstadt, "and take turns leading. While riding the pace lines, we'd often get into deep conversations about life and relationships and careers," adding that many of the riders were experiencing life transitions. Just a few days into the trip, Halverstadt discovered that not only could he make the trip, he was one of the stronger riders; one of the staff members even referred to this former Kenyon swimmer as "a hammer." In addition to learning that he was physically and mentally up to the 3,700-mile journey, Halverstadt was surprised at the joy he felt when riding alone. "I found myself in prayers of thanksgiving, filled with absolute appreciation for the opportunity to experience this trip." Halverstadt's almost-daily blog entries nicely convey his observations: Heavy winds blew clouds of pine tree pollen across the road almost obliterating the sight of those ahead... The craggy hills of yesterday's ride have melted into rolling prairie hills. Not surprisingly, long daily bike rides breed constant hunger pangs. "In addition to three large meals a day," he says, "we'd snack at pre-arranged rest stops, feasting on bananas, oranges, crackers, and Gatorade." Despite the large intake, Al shed ten pounds from his six-foot-three-inch frame. The trip, of necessity, was highly structured to ensure the safety of all concerned. Every evening the riders and staff met to review the next day's ride and receive detailed maps. "America is made up of so many different cultures as well as different topographies," Halverstadt reflected at the end of his trip. "The Mormons in Idaho, the Indians in South Dakota, the Lutherans in Minnesota, the farmers in Vermont--they're all so different from one another." He credits the matriculation speech by Kenyon's then-president Gordon Keith Chalmers for giving him the gumption to tackle challenges such as a cross-country bike ride. "He said that we were embarking upon a life-long journey; that we needed to exercise curiosity and remain ever open to new discoveries." Never one to stay on life's sidelines, Halverstadt envisions new challenges in his future. "Maybe I'll study celestial navigation. Or get my ham radio license." For the moment, this seventy-three-year old "hammer" is content to rest his legs and review his blog musings: Journeys like this are always unique, if not entirely uncommon. It must be the journey that counts. It's the encounter, the unexpected, the surprising that transforms and ultimately makes us real. To read the full blog about Halverstadt's ride, go to: www.cycling2curecancer.org. He and his friend Rick Garbe have raised over $78,000 for the Cancer Research Center at the University of Colorado, and they're hoping to reach their goal of $100,000.